Most of us know about the goodness of black pepper, right? As far as I know, black pepper helps in good digestion and relieves cold symptoms. I remember my mom used to make small balls out of jaggery mixed with black peppercorns to treat cough. It really worked for me! I recently heard that it is better if we replace red chili powder with black pepper powder, as peppercorns proved to possess many medicinal benefits. I usually add red chili powder while making wheat dosas, but this time I thought of using black pepper powder. Another reason was, I had bad cold that day. So thought it would work both ways: good for my throat and also give a different taste to wheat dosas. It really tasted delicious and spicy. Combine wheat flour + rice flour + black pepper + salt using buttermilk. If no buttermilk is available, just add some plain yogurt and water to mix the batter. The batter should be thin. Heat a non-stick pan. Take a ladleful of batter and first pour around the edges of the pan in a circle. Quickly fill in the circle to make it into a big circle. Pour some oil around the dosa and let the dosa cooked for a while. Then flip it over and pour some more oil (optional). When it is cooked on both sides, remove from the pan and transfer to a serving plate. Enjoy these delicious and spicy dosas with your favorite chutney. We had our dosas with peanut chutney. “JFI – Wheat”, hosted by Roma of Roma’s Space. Jihva for Ingredients is a monthly event started by Indira of Mahanandi. “Think Spice..Think Pepper”, hosted by Divya Vikram. Think Spice is originally started by Sunita. crisp and spicy dosas looks yummy on that plate Uma. Dosas looks pretty with the lovely color and lacy feel. I usualy add crushed pepper+jeera to wheat batter. Adding buttermilk is new to me. Thats a nice idea of incorporating pepper in dosas..
Mouthwatering! 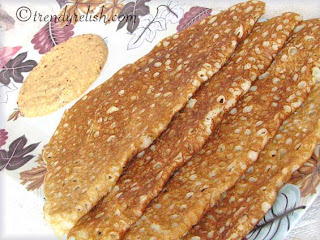 I love wheat dosas and this is a good idea,next time,for sure I am gonna try adding pepper! dosalu chaala avunayi gaani pindi soak cheyakundane bhale chesere. nice dosas uma...i love wheat dosaas..they looks perfect !! Love the addition of pepper powder, i usually add cracked peppercorns n cumin seeds, Dosa looks crispy n prefect..
Lov the addition of pepper powder in wheat dosa...Crispy and yummy looking! Instant dosa recipes are very useful indeed. I love dosas that have these big airy holes in them. I will surely try yours out. Uma..Your dosa's have come out well..Second pic looks great! Crispy and spicy dosa ! Adding pepper great idea! your dosa's look perfect! Crispy and yummy. Can I have some? Dosa looks reallyso soft and delicious. Wow those are some perfect porous dosais! Did you add the usual atta for the wheat flour or did you add something else? Wow... Looks lovely uma! Gotta try this soon! Bookmarked! Dosa looks very delicious Uma. Can I have that plate? Dosa looks delicious with peanut chutney....adding pepper is a nice twist...good one. Dosas look yumm. Nice addition of pepper..Usually I just add cumins..This is perfect..
Dosa looks simply Delcious. I will try this. Perfect entry Uma. Thanks for sending it towards think pepper event. The dosas look perfect, love the porous texture. Looks so yummy Uma! Adding pepper increases the flavour! Simple and healthy dosa.Adding pepper is new to me.. 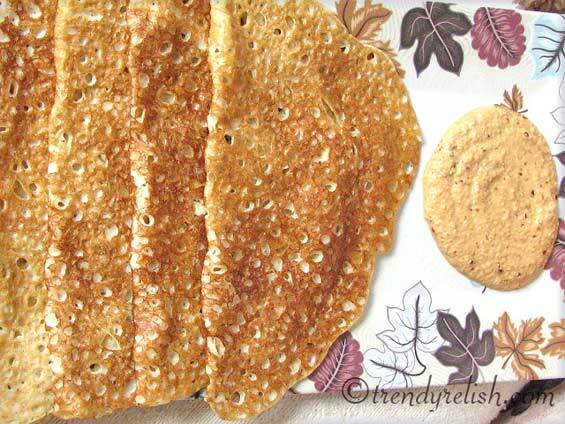 Wheat dosa with pepper, looks gud.. never tried pepper in dosa, need to try !! I love all your quick dosa recipes, Uma, and this one sounds really special with the ground pepper. It's one of my favorite flavors. Thanks for the recipe! can i have one of those, right from the plate, it looks so tempeting. Perfect dosa uma.I daughter calls it holes holes dosa and ur looks perfect. 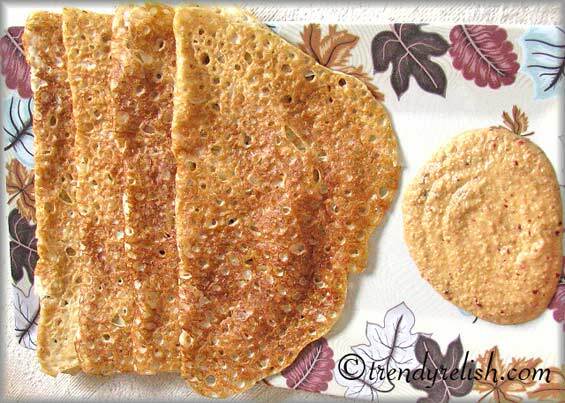 The dosas look lacy and very perfect.never ever added pepper to my wheat dosa batter.Will surely try this next time. Uma that dish tells me that 1 + 1 = 3 for a event!..nice twist and sounds so interesting! Oh this dosa looks yummmm with chutney!!! Lovely Uma!!! Looks crispy. i always a big fan of spicy food. wonderful and exotic dosa. only i want to know that wether dosa batter require fermantation or not? thanks. Thanks for dropping by! No, this dosa doesn't need any fermentation. This is an instant dosa. Just mix the batter and it's ready to be prepared. wonderful dosas uma, love to have them.